Us rocket scientists — and particularly Rocco — love our iPods. In fact, Rocco’s been waiting for the Apple patent/trademark filing from 2006 to come true for years now. We like iPod docks, too. At the top of Rocco’s Christmas list is a nice, clean iPod dock that will deliver a quick charge and sync. Let’s just say that Rocco’s been pretty good this year, and so Santa is looking. There are a lot of options to consider. This miConnection Zork Alien iPod dock seems appropriate for Rocco’s obsession with SETI, and it’s only $23. Or we could go with something more "professional," like this basic unit for $40 or this sharp KefDock, which is designed to integrate your iPod with your home theater system. Of course, what Rocco really wants is a dock with integrated speakers, one that will charge and sync while thumping out some heavy bass. We could harken back to Rocco’s memories of the sock hops he attended as a lad with this jukebox, but it’s $289, and, in truth, Rocco hasn’t been that good. So what to do? Well, Santa does have some elves, so why not a DIY or DIE ("Do it, Elves!") project, since it is the penultimate Friday before Christmas? Or, if you want really simple — or to broadcast your green, recycling machine lifestyle — you can build a dock using the packaging material that came with your iPod. 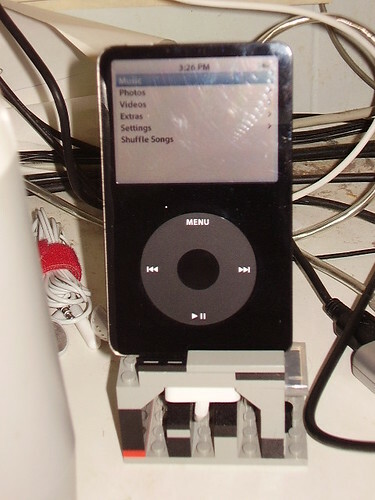 For ourselves, however — having a nearly unlimited supply of elves — we’re going to go with the start-from-scratch, design-it-yourself iPod super dock project recently posted Engadget.com in four parts: 1, 2, 3, 4. This entry was posted on Friday, December 14th, 2007 at 6:58 am	and is filed under Around the Blogs, Cool Stuff. You can follow any responses to this entry through the RSS 2.0 feed. You can leave a response, or trackback from your own site.